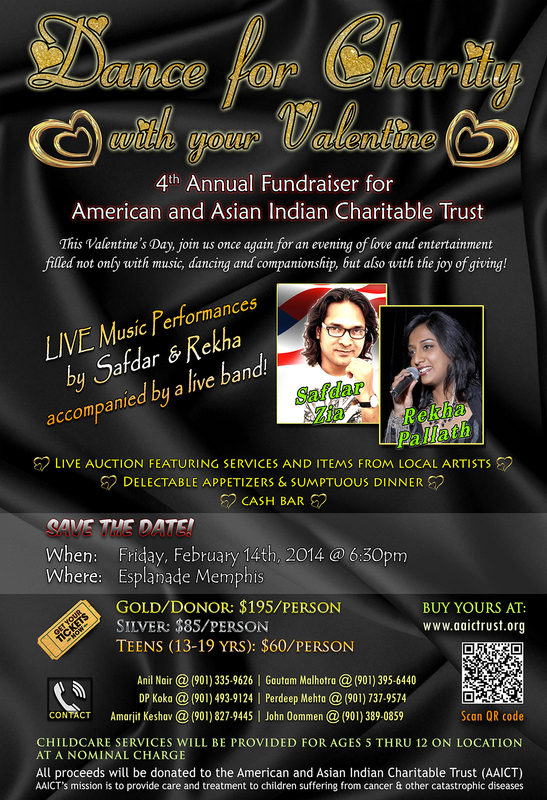 Friday Feb 14th, 2014 at 6:30 p.m. The 4th Annual “Dance for Charity” event organized by AAICT (American & Asian Indian Charitable Trust – a 501(c)(3) non-profit organization), is on Friday, Feb 14th, 2014 at the Esplanade in Cordova, TN. Come join us for a wonderful evening of Dance, Music and catered gourmet food. As with prior years, this will be an exclusive event with formal attire, live auction & a lot of dancing! 100% of the net proceeds from this event goes directly for continuing treatment for existing patients and for taking on new patients. Please note “Dance for Charity” event is for Adults, and children aged 13 & older. Child Care services will be provided at the venue for children 12 & under, for a nominal fee of $10 per child (Pizza dinner included). Get your tickets early to avoid disappointment!